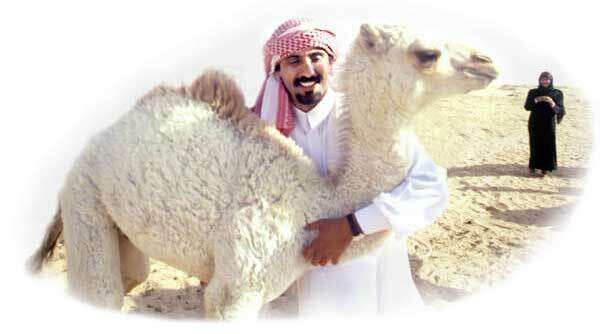 Once upon a time in Ain Dar, my family had a female camel called Makhulah. It was a beautiful creature and also a natural leader. Now, usually we keep the camels hobbled, but one time, my father forgot to retie Makhulah’s rope and so, she left Ain Dar – and took all the herds with her! Now, the village of Sahaf is nearly 200 kilometers away. We drove straight there and arrived at 4 PM. “We’ll go to the drinking trough,” said my father. Now he took me a little ways away and there in the distance I could see the shapes of many, many camels. Now Makhulah knew my father’s voice very well, so he started to call: Ma-khu-laaaah! Ma-khu-laaaah! Then he went and hid underneath the car. And Makhulah appeared in the dark and she went over to the car and leaned over and kissed my father right where he was. And my father began to cry. He was so overcome that it seemed his lungs were going to burst. And I began to cry too.